Everything was working fine and Omniauth has stopped working suddenly. I didn't make any code changes. I checked Twitter Apps Settings: I have callback url to my main production url, and Callback URL Locked to No. All keys are correct. Now on twitter callback URL, you must have to add 2 callback URLs and the callback URL must be the path of your application. I had faced the same problem, now on adding the 2nd callback URL, it's fixed. the problem is avoided. Strange, since the RailsApps tutorial warns against using 'localhost' at Twitter. This is almost certainly related to this change: Action REQUIRED - Sign in with Twitter users must whitelist callback URLs. In 30 days, we will begin enforcing the whitelist such that any URL not added to the whitelist will fail. This means that URLs can no longer be programmatically overridden in calls to the oauth/request_token endpoint 112. The callback_url parameter provided must match one of the whitelisted callback URLs. While we generally provide longer than a 30-day notice for changes like this, this timeline allows us to continue to provide a safe and secure experience for developers and our users. You can add callback URLs to your whitelist on the applications settings page on apps.twitter.com 488. Enable the setting “Enable Callback Locking” to test that only URLs you have whitelisted are accepted. Callback URLs will automatically be locked and the whitelist will be enforced starting on June 12th. The “Enable Callback Locking” setting will be removed on this date. I could not get this to work in development with 127.0.0.1 so I ended up creating a DNS A record that pointed to 127.0.0.1 (e.g., dev.example.com) and used that in the callback url settings on https://apps.twitter.com. I just resolved the issue by putting https://domain/oauths/callback in the Callback URLs list. Make sure you enable the callback locking option. Not the answer you're looking for? 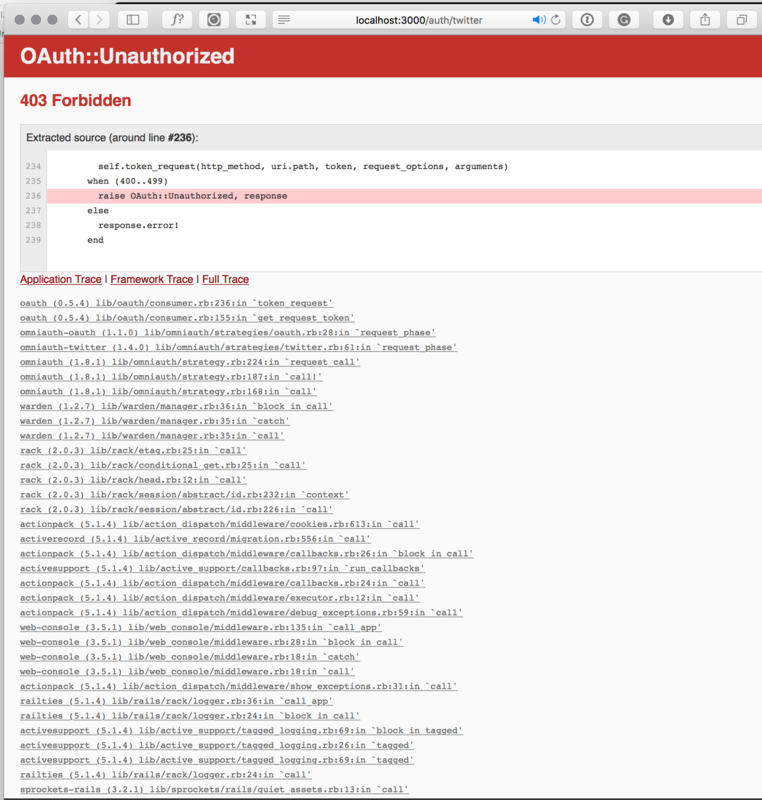 Browse other questions tagged ruby-on-rails devise ruby-on-rails-5 omniauth omniauth-twitter or ask your own question.